The match-three puzzle game challenges players to draw lines over matching symbols to give children ice cream. 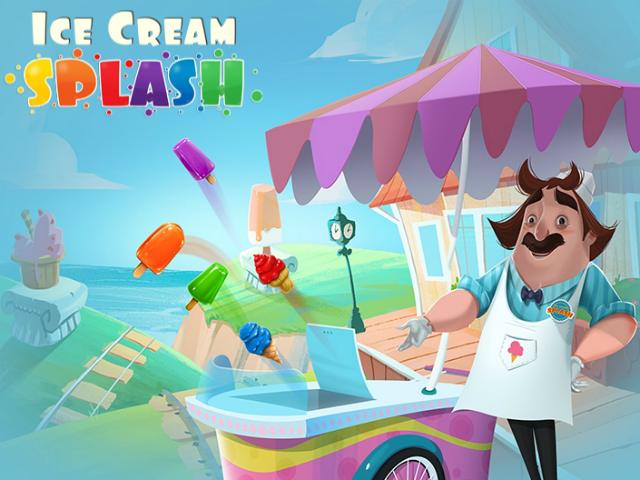 Social games company Renatus Media has released its newest title on Facebook: Ice Cream Splash. The line-drawing puzzle game was developed by Crystal Brothers, and features 105 levels, each challenging players to draw lines on ice cream cones, popsicles and other cool treats to remove them from the screen and complete specific goals. Each level has a move limit and a different requirement. One may simply ask players to earn a large number of points, while another challenges gamers to remove jelly squares by making matches on top of them, and so on. Gameplay here see players dragging their mouse over touching groups of matching symbols, to create lines of three or more symbols in each move. As players create matches containing more than five symbols, special power-up treats are added to the board. These may remove a small cluster of symbols surrounding the power-up, or can clear an entire row or column. Finally, matches of 10 or more symbols create rainbow treats, capable of clearing every symbol of a single variety from the screen. Gamers can spend premium currency on some additional power-ups before levels begin, while others are available mid-stage. For instance, one power allows users to instantly clear one chosen symbol from the board. Users earn up to three stars on each level, depending on their final score, and can compare their scores with their friends’ on level-specific leaderboards. Ice Cream Splash is available to play for free on Facebook.